In this week’s review I have started with the opening paragraph on the SolusOS website. Last week I wrote a review about Snowlinux 4 to see if that operating system achieved everything it set out to achieve. Unfortunately I think it fell short because it stated that it intended to be easy to use with a carefully selected range of software. As someone with a lot of computing experience and a fair amount of experience using Linux I found that for an average person the installation could cause some issues and there were problems with setting up the internet. In addition to this, the software installed did not provide a complete solution. This week I am happy to report that I think SolusOS really does live up to the statement made on its website. 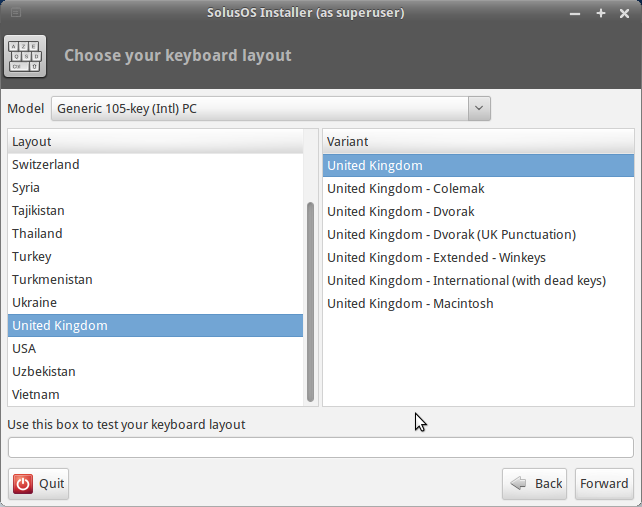 SolusOS is very stable, is easy to use and comes with a complete set of software for the average user. 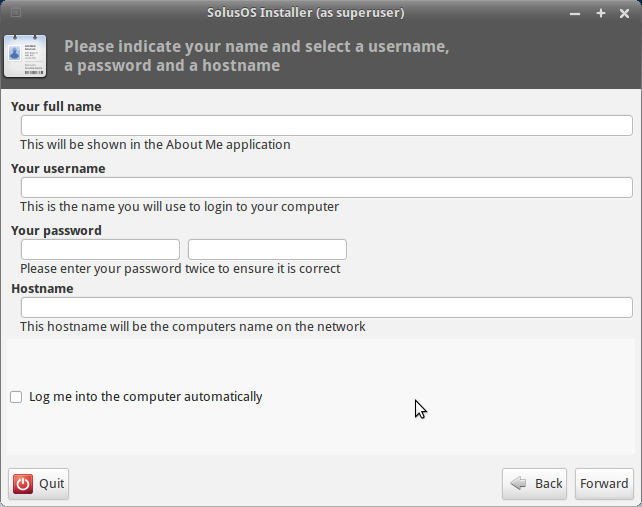 The installer for SolusOS is the same as the one for Snowlinux so this may cause problems for users new to Linux and I will explain why shortly. The installation starts easily enough. Then comes the trickier bit for your average Joe. First of all you are asked which drive you wish to install SolusOS to. Now for a Linux user this makes perfect sense but if you are a Windows user then you are used to drives being called C:, D:, E: etc. Linux names drives differently and not only that it depends on the type of drive what the naming convention is. This is of course not the fault of SolusOS or Snowlinux as it is just the way things are done in Linux but it can be made simpler. Linux Mint and Ubuntu give options such as replace your existing operating system or install alongside your current operating system which for a novice makes the installation a much more accessible option. Moving on to step 5 you are then asked how to partition your drives and also after partitioning you have to set the root drive. The partitioning bit would make many would be Linux converts turn away in fear. The Ubuntu and Linux Mint installers I think work better in that for novices they give an option that works but they also give a partitioning tool for the more experienced user. Step 6 is to enter the name of the main user of the system along with a password and a host name for the system. 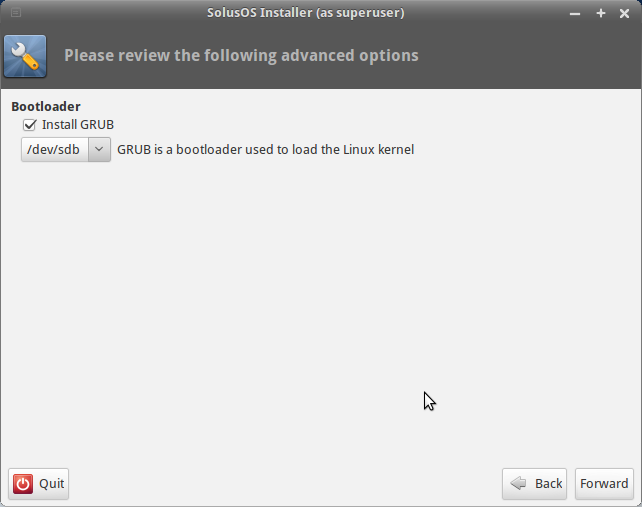 Step 7 asks which drive is to be used for the GRUB bootloader and step 8 asks you to confirm your settings before installing SolusOS. When you run SolusOS for the first time a wizard appears. There are five steps to the wizard. You can run the first start wizard at any time by selecting it from the settings menu, although it would make more sense just to pick the network connections manager, the firewall manager or the update manager as the chances that you need to configure all the options again are slim. 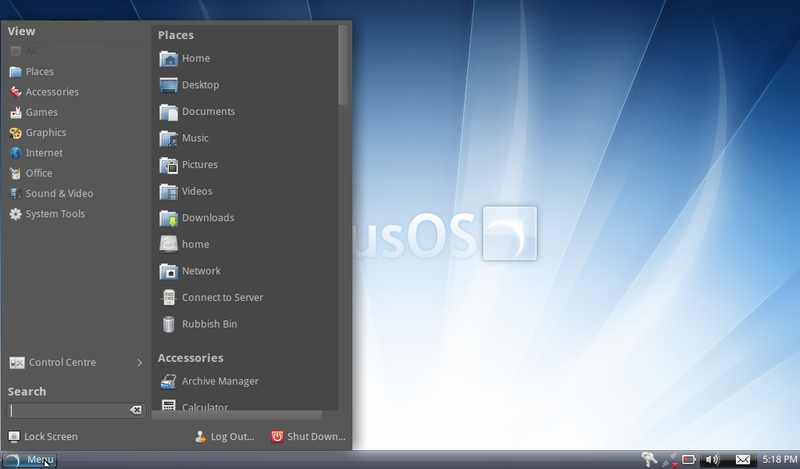 SolusOS uses Gnome 2.30 which is a blast from the past for many Linux users. 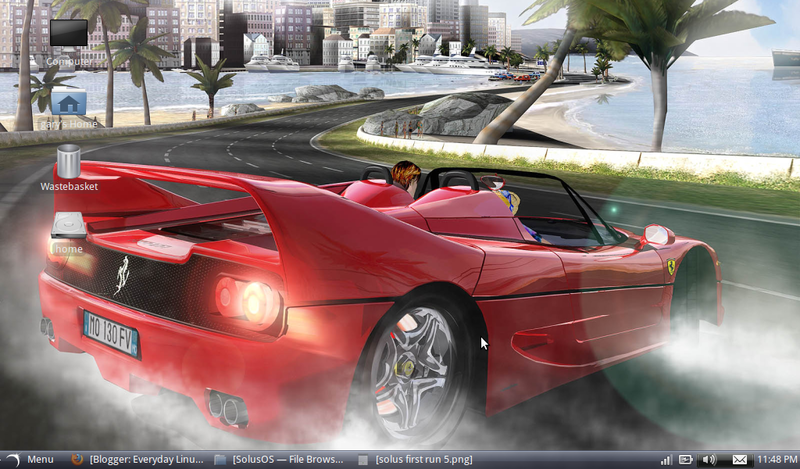 It looks great and it runs smoothly and performance wise it is fantastic. 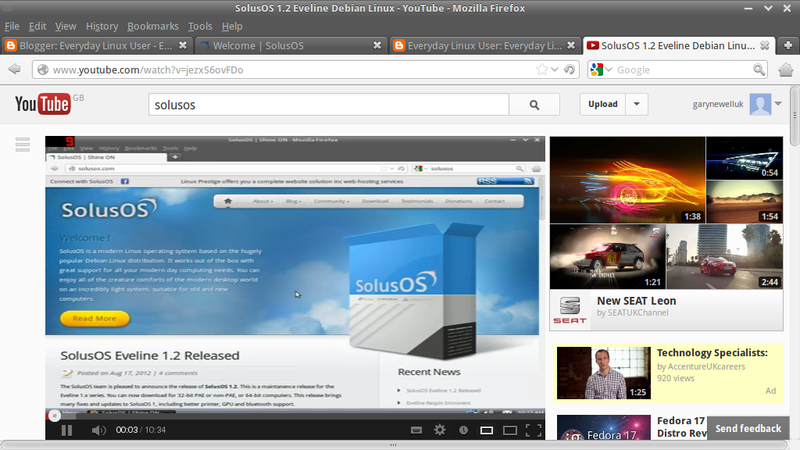 The layout for SolusOS is like a lot of Linux distributions and would be familiar for most Windows users. There is a plain desktop with a taskbar at the bottom. There is a menu button in the bottom left and a system tray in the bottom right with icons for networking, battery power, audio and messages. There is also of course a clock. Clicking the menu button brings up a fairly nice menu with two main panes and a search box. The menu makes it easy to navigate SolusOS. Firstly there is the search box. Enter the name of the program or the type of application you are searching for and it will appear in the right hand pane. Alternatively you can select the category on the left hand pane to produce a list of results in the right hand pane. From the menu you can also bring up the control centre which enables you to perform system functions such as change desktop effects, desktop background, set up Flash, set up hardware, install applications etc. As with a lot of Linux distributions (and Windows really) the default wallpaper is fairly bland and it is nice to change it to something more in tune with your own personality. 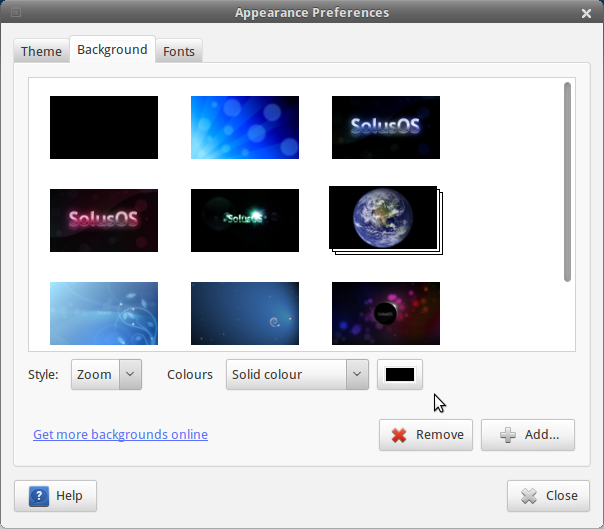 In SolusOS it is easy to change the desktop background by right clicking on the desktop and then selecting “Change desktop background”. SolusOS has a range of wallpapers to choose from but if you don’t like any of the stock images click the “Add” button and choose one of your own images. 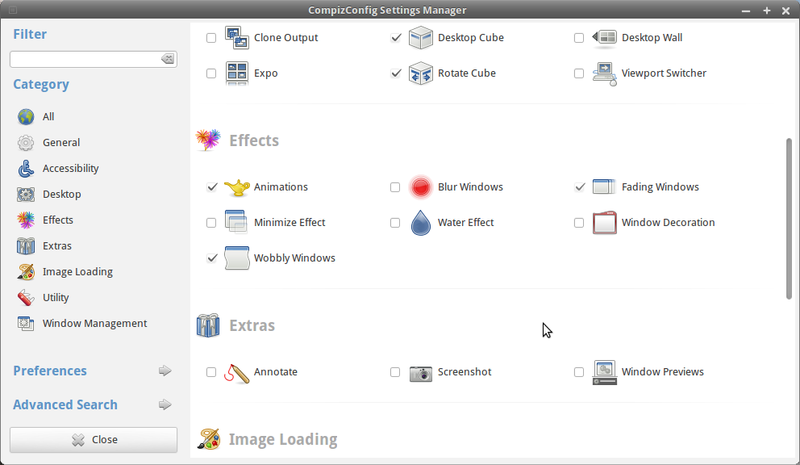 In addition to just changing the desktop background you can also add some effects using the Compiz Settings Manager. There are a number of effects to choose from such as fading windows and wobbly windows and animation effects which means you can personalise the experience as much or as little as you want to. SolusOS works straight out of the box. I was sat on a train when I first started typing this post and I was able to see the wireless connections for the train company, a few home wireless connections and some which were clearly people’s mobile phones. I managed to connect to my own mobile phone there and then using the internet connection sharing wizard on my phone. I have since also managed to connect to my home mobile broadband and my home broadband connection. SolusOS makes it as easy as possible for users. Flash is installed by default as are the MP3 codecs required to play music. This means, music, video, games etc work straight out of the box. Sometimes when I install a Linux distribution I wonder why I had to download 800mb of ISO. The reason for this is that some distributions provide a full set of applications such as LibreOffice, Rhythmbox, VLC Player and WINE and other distributions for the same size give you Abiword and Gnumeric and that is it. There are various other applications but the ones highlighted above are the main ones. You will notice the duplication when it comes to movie players. I think the reason for this is that some you get when installing Gnome by default and the developers obviously decided there were better ones to include. 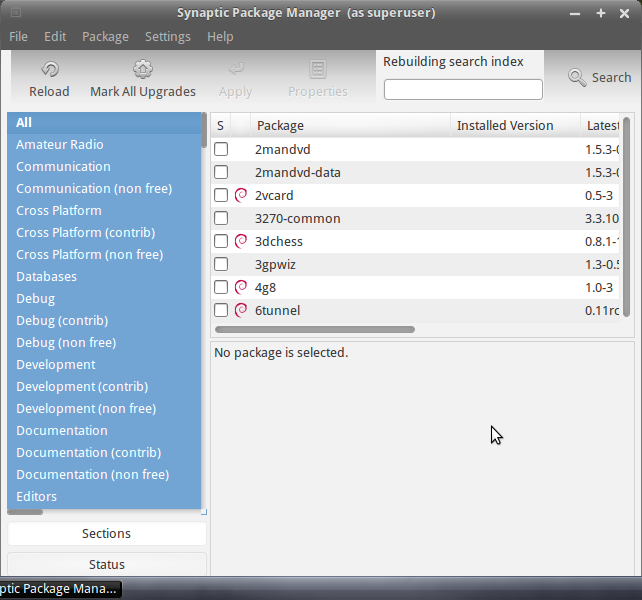 SolusOS uses Synaptic for package management. Synaptic is fairly easy to use. In the left hand pane there are a list of categories and in the right hand pane there are the applications within that category. If you click on an application a description will appear at the bottom of the right pane. Installing applications is a two step process. The first step is to mark the applications you wish to install and then you click “Apply” to install the applications. Dependencies on other applications are automatically marked. Does SolusOS live up to it’s promises? The answer to that is yes. SolusOS is easy to use, comes fully featured with all the necessary multimedia codecs and Flash installed and has a really good selection of applications. The installer could do with a bit of work. I think the installer will put potential Windows users off unless they are computer savvy to start with. Having said that of course it is unlikely that non computer savvy users would ever attempt to install a new operating system. Gnome 2 is still great and for anyone with an older machine SolusOS is a brilliant choice. 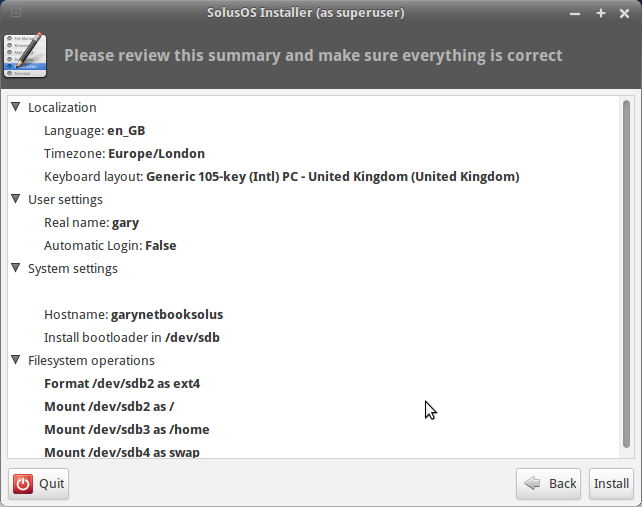 The downside of SolusOS using Gnome 2 is that at some point a decision has to be made. Will SolusOS remain on Gnome 2 or move over to MATE or XFCE. 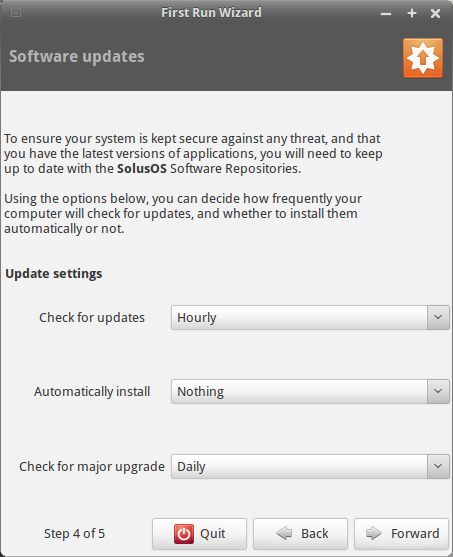 It is easy to see why SolusOS is riding high on Distrowatch. It really provides a no hassle approach to computing. I am a Solus user. 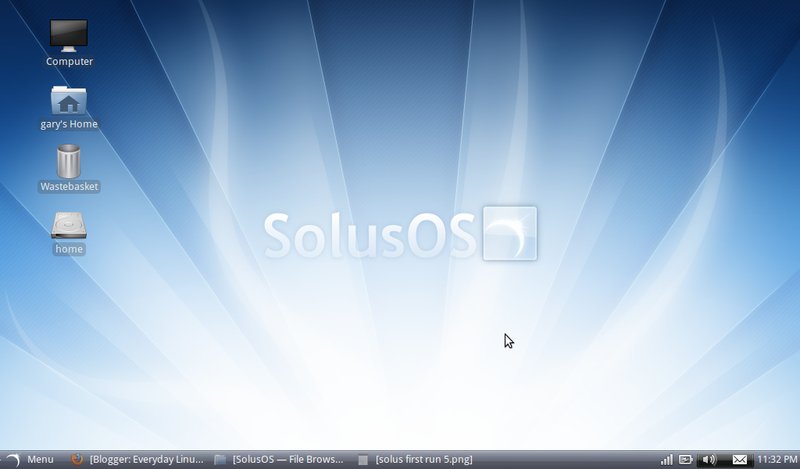 Solus is going it's own way. It is forking the classic mode of Gnome to Consort as it's desktop. It is also changing the package management to PISI (Pardus package management). I have not tried the Alpha, but I love Eveline 1.2. I see that my thoughts about "one-man-band" and dying of GNOME2 were just thoughts. Good luck to SolusOS! Hi, I'm also a SolusOS user. Like the others, i'm impressed by the stability and the speedy of this OS. I believe that the lack of users is one of the problems of SolusOS. I'm, as user, grateful by the review. I've got the chance to take a sneak look on the installer of the 2.x series… and will be great. I believe that the new installer will be more newbie friendly… even more than ubuntu or mint ones. Good morning! Nicely exposing about that distro. Good job! I applaud distro makers in general. 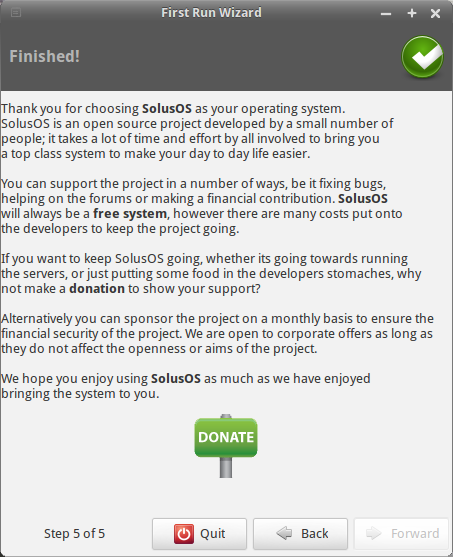 I read Helios's blog about Solus. It's an impressive story. But I would also like to take the opportunity to praise Slackware. It's nice to have a distro still available that is not aimed at being so easy that a cretin could install and use it. Not that I seek to deny cretins the opportunity to use a PC, just that this relentless race to make everything childlike and easy has an unheeding, 'race to the bottom' aspect to it. There is little point in making everything easy if the long term result is that the next generation of Users is not inspired to get serious and get involved. Many people switched to Linux, from Microsoft, because of their treatment of Users – insultingly dumbed down UI's, stupid naming conventions, daft design decisions, etc. Of the people who don't use Linux, a tiny minority were put off by the technicality of the install process and so making distros so easy that anyone could install it is a false response. The solution is press coverage and advertising, which are both areas where Microsoft currently control the market. I have doubts about the policy of making Linux as dumb as Windows, in order to attract more Windows users. It is your kind of arrogance that keeps people from coming to Linux. Who appointed you as the judge of what is right and wrong? I see people who say they tried Linux, but the people there are downright rude. Solus is easier, for the newbie, but just as powerful as any other Debian or Linux based distro. A great number of users, if you read the forum, are coming from other Linux distros. I have run numerous distros myself, as I enjoy learning, including Slackware and Arch. That said, sometimes I just want to get things done, use my computer and be productive. That is why I really liked Solus, less working on the system and more getting work done. It just works! If you want people to come to Slackware, you have to get them to Linux first, and not everyone wants to be a system administrator. Please embrace the diversity in Linux, rather than be an arrogant troll. Thank you for proving my point that Linux users are the most unfriendly, unhelpful people on Planet Earth. It's why I went back to OSX & Windows 7, because when I asked a question, I got attitudes like yours. What a strange post. Perhaps you can give me ONE good reason why Linux shouldn't be easy to use? Do you like editing config-files? Then stick with Slackware. The real world moves on, and I am happy with it. Do you go anywhere by riding a horse ? You dont have a cell phone ? The terms "Human-Computer Interaction" and "User Interface" mean nothing to you ? If you want to do anything as your grandfather did, it is up to you. I didn't say the Windows drive letter system was better. I said it was different. A Windows user coming to Linux might not understand the naming convention of drives. I find it odd that you seem to consider the way the file system of unix-like systems to be inferior to the way Microsoft Windows work. Mounting each drive as a new letter instead of under a single root directory is nonsense and just one of the many reasons Windows is technically inferior to Unix. He posted his reply to the one above. In addition to what he says there, it's worth noting that his concern is not so much the difference in how drives and partitions are mounted as the device name conventions. For the purposes of the installer, a user needs to know what is meant by sda1, sda2, sdb1, etc, as opposed to C:, D:, E:, etc. I think that the Unix style is more useful, but I can see why lazy developers would prefer to unify mounting and device naming conventions. Yep I put my comment next to the wrong message. sorry about that. 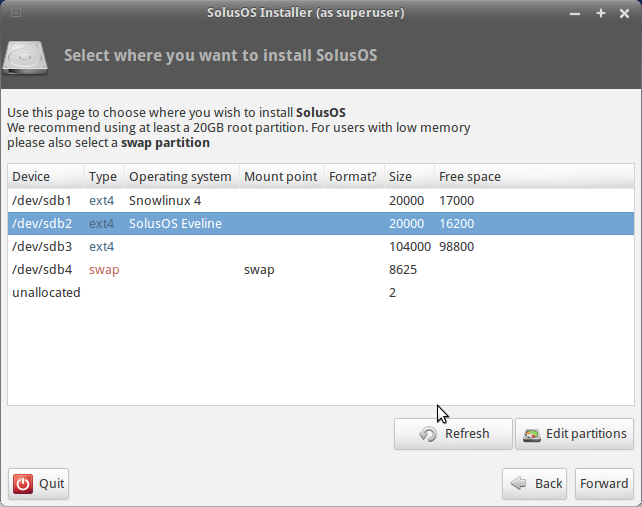 I have been trying to install solus but have been stumped by the partitioning part of the installation process..Exactly for the reasons mentioned in this blog..I only came across this blog in my efforts to find a simple explanation for how to do that part of the installation. I still haven't found any. So I am unable to install. Let me know your current set up and what you are trying to do and I will write an article explaining how to partition for your requirements. 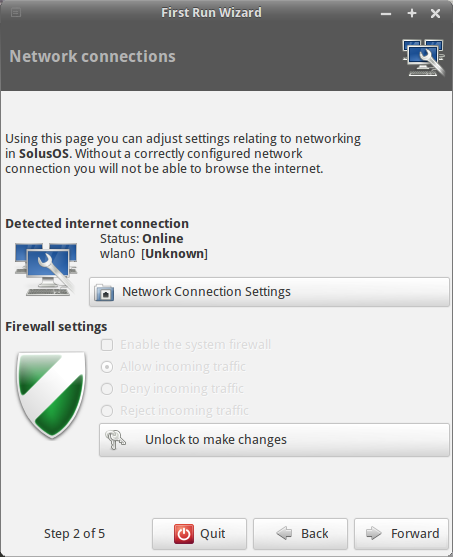 What I need to know is whether you are running Windows at the moment and if so do you want to run SolusOS side by side with Windows or do you want to replace Windows with SolusOS. 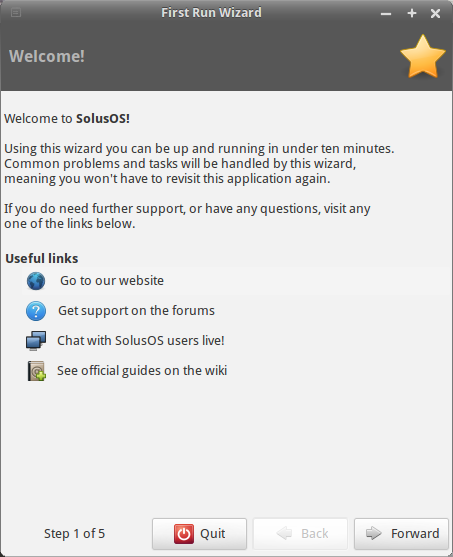 If you are not running Windows what are you running and how do you want SolusOS set up. IE do you want to run side by side with another OS or have SolusOS as the only OS. If you can also give details of disk size and how many hard drives you have on your machine that would be great. The more information you can give the better otherwise I'll make assumptions and do my best from there. SolusOS is great! I'm still hanging on to some old hardware. Ubuntu's Unity is not happy with it. Gnome 3 isn't either. SolusOS works great. I had some trouble with file sharing. It didn't want to work as described. I installed Network Admin. The GUI is started from a terminal as root with shares-admin. It was a little goofy but it worked. 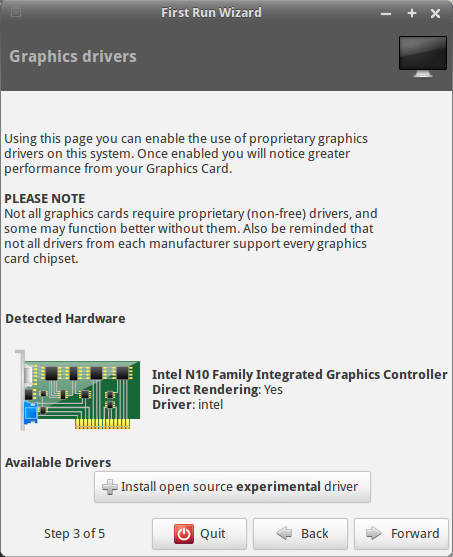 My display card Nvidia GEforce FX 5200 uses the 173 driver. Not going to happen. The default driver is doing well and in 3D. On partitioning you just need to set the main to / and set up a swap. I hope this distro servives. I really like it. Unfortunately the SolusOS bit the dust. RIP! Yes it is very unfortunate. Read my review of Point Linux though for something that should fill the void. SolusOS is back as of August 2015 in case anyone is curious, and WOW. It really IS fast as hell on this POS Aspire One. Beats every version of Puppy I've tried, hands down. Definitely worth a look if you have an old craptop you're wanting to re-purpose (and need a DWM) so grandma or your kid can check their e-mail or use Google Apps for homework, that kind of thing.